MUMBAI: Widely renowned artist Jan Blomqvist will bring his fusion of genre-crossing sounds to all corners of the globe this year. 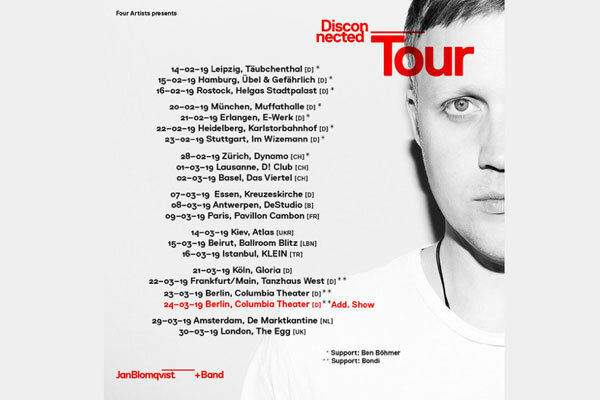 Starting with a European tour for his recent album Disconnected, Jan will be playing several shows with his band, as well as, solo DJ sets across the continent. Kicking things off in Germany, where Jan usually bases himself in the capital city of Berlin, Jan will soon move into Switzerland, Spain, Belgium, France and Ukraine, before dates in Lebanon, Turkey, Amsterdam and London next month. Following the European tour, Jan will be heading across the pond for a string of solo gigs including the esteemed Coachella Festival and Art With Me Festival in Coachella. An innovative artist, Jan was one of the first producers to bring techno into the concert realm. Leading a band consisting of Christian Dammann (drummer), Felix Lehman (pianist) and Ryan Mathiesen (lyricist), the concert shows also include a light and visual show for a fully immersive experience.